A day in a real tropical paradise where we can explore nature in two different forms: the rainforest with its variety of plants and multi-coloured birds, and the barrier reef, which puts on an incredible show for us with its colourful fish, anemones and bizarre coral formations. 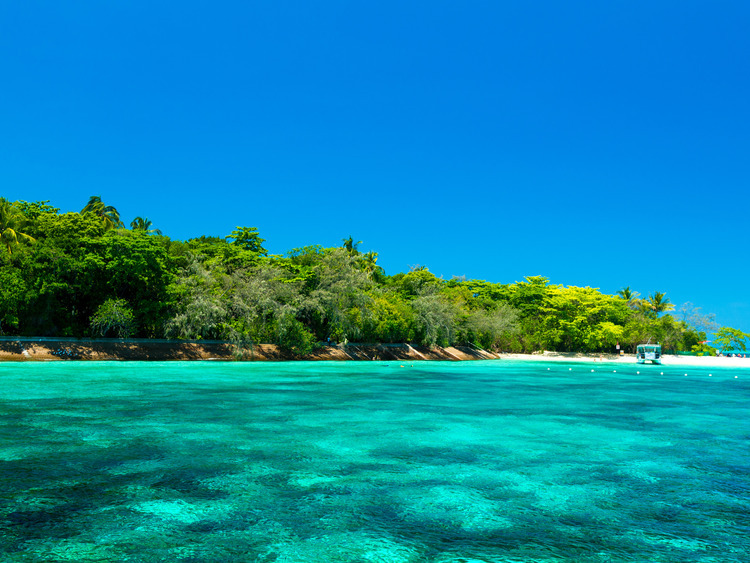 The excursion will begin with a catamaran cruise across the Coral Sea, which, as its name suggests, surrounds the largest coral reef in the world. Our destination is Green Island, the only coral island in the great barrier reef on which a rainforest has grown, home to over 120 species of native plants and a colourful population of birds. On the island, we can enjoy a wide range of activities, such as exploring the coral reef with its rich underwater life on a glass-bottomed boat, or simply relaxing and switching off in this tropical paradise. Nature reigns supreme on Green Island, so we will walk through the magical rainforest, sprawl out on the white sand and relax, enjoy a swim or go snorkelling to discover the multi-coloured flora and fauna lurking beneath the crystal-clear waters. When we start to feel hungry, we can enjoy a buffet lunch of hot and cold dishes at Canopy Grill restaurant. In the afternoon, we will have more time at our disposal to enjoy the incredible activities available on this fabulous island before returning to Cairns port on our catamaran.